Radio420™: Sadistik’s “Haunted Gardens” LP Dropping 4/20; Announces “Haunted Gardens” North American Tour This Summer With Trizz! 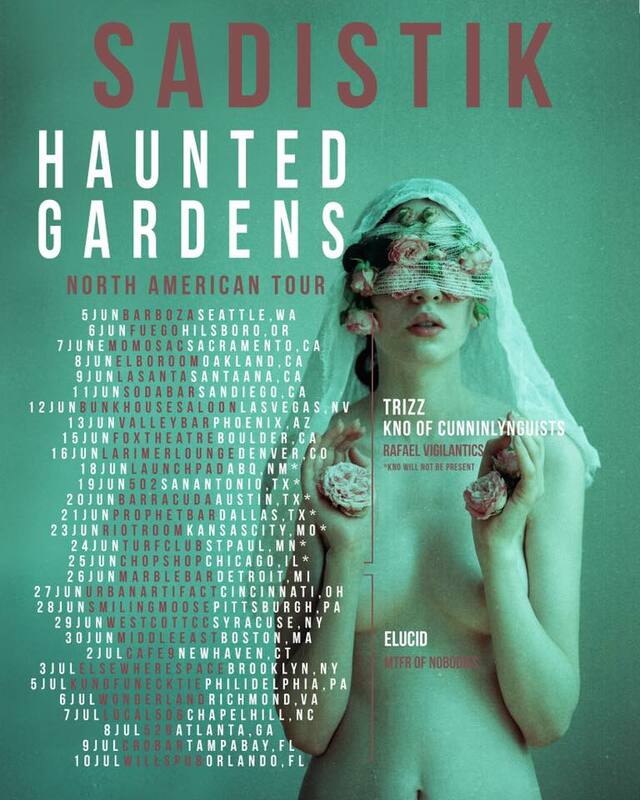 Sadistik’s “Haunted Gardens” LP Dropping 4/20; Announces “Haunted Gardens” North American Tour This Summer With Trizz! Sadistik has been hailed by various media outlets as “The Cigarette Burn Rap King.” Even Krayzie Bone of Bone Thugs N Harmony has proudly gloated about being a fan of Sadistik’s gothic material. The Seattle emcee’s gloom hip-hop originality keeps slaughtering the Billboard Charts one hundred percent independently, while currently, Sadistik fans around the globe are foaming at the mouth profusely from simply clamoring for more fresh dark hip-hop from Sadistik. We here at Faygoluvers.net have great news. Sadistik’s next full length LP titled “Haunted Gardens” officially drops on Saturday, April 20th and its damn sure to grab the hip-hop game by the throat and choke slam the genre somewhere beyond the Twilight Zone! Sadistik will also be celebrating the release behind “Haunted Gardens” with an early release party in two days (this April 12th) in Los Angeles, California with opening support by Kno of Cunninynguists, Trizz, Slug Christ, LSDMTHC, and ZeuroPoint. Fans who attend will be able to receive “Haunted Gardens” early! Reminder! The release party will be 18+and hosted inside the Jewel’s Room at Catch One 8 p.m PST in two days. What’s even more fresh is the fact Sadistik will be hitting the road this Summer to support “Haunted Gardens” with fellow Faygoluvers.net 2016 Break-Out Artist of the Year winner “Trizz”, along with Kno of Cunninynguists, Elucid, Rafael Vigilantics, and MTFR of the Nobodies!